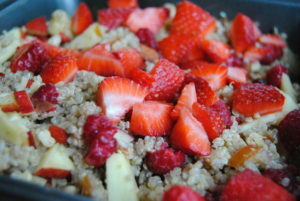 Cook the quinoa and add the nutmeg and cinnamon half way through (total cooking time approximately 15 minutes). If you want to make the dish last longer, add in 2 cups of cooked quinoa and keep the other ingredients the same. 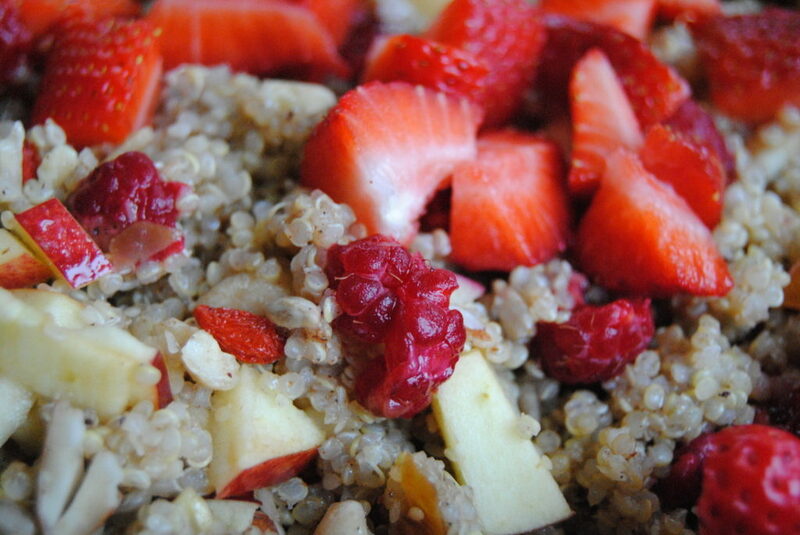 The less quinoa, the more intense the flavour is…but it does go quickly! I’ve tried it both ways and they’re equally delicious. When finished, transfer to baking tray and stir in coconut oil. Add in all of the ingredients except the berries and coconut flakes. Bake for about 10 minutes, just to mix the flavours and lightly toast the apple pieces. Add in the berries (and raw honey if desired) and top with coconut flakes.